For the Danish gymnast, see Hjalmar Peter Johansen. Fredrik Hjalmar Johansen (15 May 1867 – 3 January 1913) was a Norwegian polar explorer. He participated on the first and third Fram expeditions. He shipped out with the Fridtjof Nansen expedition in 1893–1896, and accompanied Nansen to notch a new Farthest North record near the North Pole. Johansen also participated in the expedition of Roald Amundsen to the South Pole in 1910–1912. Born at Skien in Telemark county, Norway. He was the son of Jens Johansen (1838–88) and Maren Pedersdatter (1838–1907). He was the second eldest son in a family of five children. He attended Royal Frederick University (now University of Oslo) to study law in Christiania (now Oslo). However, he performed poorly at law school, due to a low attendance of lectures. At the age of 21, Johansen's father died, prompting him to leave law school. After dropping out of school, Hjalmar briefly worked in an office job at Bratsberg. However, by that time he had already made his mark as an athlete; he was an excellent skier and gymnast. In gymnastics he became Norwegian champion in 1885 in Fredrikshald and world champion in 1889 in Paris. In 1910 he was one of Amundsen's men on the Fram and in Antarctica. Amundsen and his men, racing for the South Pole with Robert Falcon Scott, started out for the South Pole too early in the season and had to return to base camp at the Bay of Whales. Johansen had disagreed with the early start and had to rescue a less experienced member of the party, Kristian Prestrud, from freezing to death on the return journey. Amundsen had taken the best dogsled and sped off towards the camp without regard for his men as a storm approached. As a result, Prestrud and Johansen had no tent or cooking equipment to melt snow and had no choice but to press on for the camp in a blizzard with extreme windchill (−50 °C) and a dangerous descent towards the base camp. Johansen had saved Prestrud from death and carried him to the base camp. However, the mishap enraged Amundsen. Upon their return to the Bay of Whales, Johansen quarrelled with Amundsen in front of the other men; Amundsen reacted to the argument by dismissing Johansen from the party heading for the South Pole. He further disciplined Johansen by ordering him to subordinate himself to Prestrud, and ordering the two men to embark on a minor expedition towards King Edward VII Land while the other members of the main expedition resumed their trek towards the Pole. Johansen was awarded the South Pole Medal (Sydpolsmedaljen), the Royal Norwegian award instituted by King Haakon VII in 1912 to reward participants in Roald Amundsen's South Pole expedition. However, Johansen had resumed drinking alcohol, became clinically depressed and in 1913 committed suicide. His wife Hilda Øvrum (1868–1956) and their four children survived him. After his death, Johansen's reputation largely drifted into obscurity. In 1997, however, biographer Ragnar Kvam, Jr. published a biography of the forgotten explorer, Den tredje mann: Beretningen om Hjalmar Johansen . As a result of this and other work, Johansen's place in the story of Norwegian polar exploration is being rehabilitated. In 2005, the International Hydrographic Organization officially approved the proposal by an American arctic scientist to name Hjalmar Johansen Seamount, a newly discovered volcanic edifice on the floor of the Arctic Ocean northwest of Spitzbergen. The location is 82 degrees, 57 minutes N, 3 degrees, 40 minutes W. The top of the undersea mountain lies at a water depth of 4800 meters. ^ "Hjalmar Johansen". Norsk Polarhistorie. Retrieved 1 February 2018. ^ Ragnar Kvam jr. "Hjalmar Johansen". Norsk biografisk leksikon. Retrieved 1 February 2018. ^ "Sigurd Scott-Hansen". Norsk Polarhistorie. Retrieved 1 February 2018. ^ "Fredrik Hjalmar Johansen (1867-1913)". The Fram Museum. Retrieved 1 February 2018. ^ "Hjalmar Johansen". Store norske leksikon. Retrieved 1 February 2018. ^ "The Forgotten Explorer – Hjalmar Johansen". Thor News. 3 January 2013. Retrieved 1 February 2018. ^ Jon Gunnar Arntzen. "Sydpolsmedaljen". Store norske leksikon. Retrieved 1 February 2018. ^ Albretsen, C. S. (2003). "Hjalmar Johansens selvmord". Tidsskift for Den norske legeforening. 123 (24): 3536–8. PMID 14691493. Wikimedia Commons has media related to Hjalmar Johansen. Roald Engelbregt Gravning Amundsen was a Norwegian explorer of polar regions and a key figure of the Heroic Age of Antarctic Exploration. He led the first expedition to traverse the Northwest Passage in 1906 and the first expedition to the South Pole in 1911. He possibly led the first expedition to reach the North Pole in 1926; the expedition of 1926 is the earliest expedition proven to have reached the North Pole. He disappeared while taking part in a rescue mission for the airship Italia in 1928. Olav Bjaaland was a Norwegian ski champion and polar explorer. In 1911, he was one of the first five men to reach the South Pole as part of Amundsen's South Pole expedition. Oscar Adolf Wisting was a Norwegian Naval officer and polar explorer. Together with Roald Amundsen he was the first person to reach both the North and South Poles. Helmer Julius Hanssen was a Norwegian sailor, pilot and polar explorer. He participated in three of the polar expeditions led by Roald Amundsen and was one of the first five explorers to reach the South Pole. Sverre Helge Hassel was a Norwegian polar explorer and one of the first five people to reach the South Pole. Polheim was Roald Amundsen's name for his camp at the South Pole. He arrived there on December 14, 1911, along with four other members of his expedition: Helmer Hanssen, Olav Bjaaland, Oscar Wisting, and Sverre Hassel. Hjalmar Riiser-Larsen was a Norwegian aviation pioneer, military officer, polar explorer and businessman. Among his achievements, he is generally regarded a founder of the Royal Norwegian Air Force. Jørgen Stubberud was a Norwegian polar explorer who participated in the Amundsen Antarctica Expedition between 1910 and 1912. Kristian Prestrud was a Norwegian naval officer and polar explorer who participated in Amundsen's South Pole expedition between 1910 and 1912. 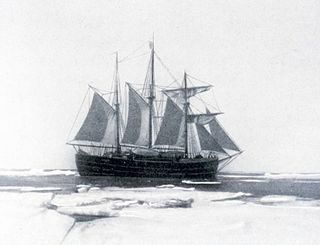 Prestrud was first officer of the Fram and leader of the Norwegian expedition's Eastern Sledge Party to the Scott Nunataks. The first expedition to reach the geographic South Pole was led by the Norwegian explorer Roald Amundsen. He and four others arrived at the pole on 14 December 1911, five weeks ahead of a British party led by Robert Falcon Scott as part of the Terra Nova Expedition. Amundsen and his team returned safely to their base, and later heard that Scott and his four companions had died on their return journey. Thorvald Nilsen was a Norwegian naval officer and polar explorer. Leif Dietrichson was a Norwegian military officer and aviation pioneer. He is most famous for joining Roald Amundsen and Lincoln Ellsworth in the 1925 North Pole Expedition. In 1928, Dietrichson disappeared with Amundsen and four others as they were looking for the expedition of Umberto Nobile. Andreas Beck was a Norwegian seal-hunter, polar captain, ice captain, and shipowner. The South Pole Medal or Medal Commemorating the 1910–1911 Fram Expedition to the South Pole is a Norwegian medal established by Haakon VII of Norway on August 20, 1912 to recognize participants in Roald Amundsen's South Pole expedition. The medal was awarded to participants in the exhibition on the day it was instituted. The medal was designed by the engraver Ivar Throndsen. Adolf Henrik Lindstrøm was a Norwegian chef and polar explorer. Eivind Astrup was a Norwegian explorer and writer. Astrup participated in Robert Peary's expedition to Greenland in 1891–92 and mapped northern Greenland. In the follow-up Greenland expedition by Peary during 1893–94 he explored and mapped Melville Bay on the north-west coast of Greenland. Among his works is Blandt Nordpolens Naboer from 1895. He was awarded the Knight of the Order of St. Olav in 1892.